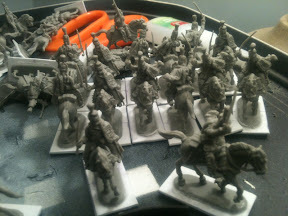 I finally finished the trimming, filing and clipping necessary to get the Grenadiers to sit their horses. These are the last unit I need for my Hundred Days games. I had trim the blanket roll so that the tails of the coat would fit. Also trimmed the inner thighs of the horsemen until they fit saddle. As Foy has said this is something akin to GCSE metalwork. The Eagle bearer and Officer (with curiously waggly sword), all that remains is the musician. Clive of Vintage Wargaming has sent me a bugler, but I haven't tried him out yet. I think I may have to strip him first (ooo'er Matron). Savage setting up the board. Featuring my very fetching Indian buildings built by Boomer. We got in a quick game of Force on Force after I got home from church last week*. Force on Force is modern wargame published by Osprey Publishing. It's quite unusual in that it makes use of a rather innovative reaction sequence that allows small units tactics to be simulated to a degree I haven't seen in other games. Also it makes use of a victory point system to allow for asymetrical engagements, so that Western Forces can take on militias and still lose despite wiping out their enemy, if they've taken too many casualties or made fools of themselves in front of the media. The scenario was based on a real engagement that occurred in 2009 in Afghanistan. US troops landed in close to a Taliban compound with the intention of killing or capturing a key Taliban leader. We used Savages generic North Africans and a mixture of Mr E's Americans and General Du Gormand's French for the US forces. We didn't give much thought to where the game was set, North African probably. So Savage and I took on the role of the poor benighted 'eathen. Time would tell whether we would prove to be first class fighting men. ...pausing only to gun down a rooftop full of insurgents. Mumar stand alone on the building. "eee's generally shammin' when ee's dead....."
...with deadly effect. With supporting fire from the compound, an American fire team seizes control of one half of the native blocking position. The Leader runs for the treeline and hopefully a waiting Toyota hilux. BANG! "eee's a daisy, eee's a ducky, eee's a lamb"
We managed to down two of the French commandos, but it was rather too little, too late. Both men were successfully casevaced with blighty wounds. All in all, it wasn't a great game for the plucky natives. The Western forces were played well and managed to play their luck out as far as it would go. I think I'll be happier playing this game with my own Cold War forces. *Good service, but a rather unfocused sermon. Certainly not a patch on what you'd find here. As may recall, at the end of the first act, the French had lost an objective on their right to a bold move by British infantry, supported by a regiment of the 4th Dragoon Guards. This left them in dire straits as it meant that any attempt to withdraw in the face of the British advance would likely be cut off. The French generals decided to risk an attack on the left, hitting the point where the British line was held by Portuguese troops, rather than attempting to retake the objective in the hope of throwing the British plans into dissarray. This was a tense moment as the British were sitting on some good cards. If they surrendered the iniative by going into square and tying up part of their hand, there was a good chance that the their plans on the French right could grind to a halt. On the other hand, the French cavalry, tougher than their Allied counterparts were in a position to crush the vulnerable Portuguese. It didn't help matters that French infantry were moving up to support the cavalry charge and would riddle a square if one was formed. On the French left things suddenly took a turn for the (even) worse as throwing caution to the wind, the 4th Dragoon Guards routed their foes completely with some rather special dice rolling. This left the French reeling as it looked like the redcoats were going to sweep in from the left and roll up the whole position. The French were left with an even more unattractive proposition, they could push where they were winning, on their left or where they were losing, on their right. But they could not do both. Eventually after some discussion they decided that something had to be done about the British cavalry on their right and they pulled the 22ieme ligne out of the line and sent them under one of General Delaborde's aides to drive off Les Roast Bifs. The 22nd Ligne having moved out of the line, charged the 4th Dragoon Guards who fell back, but then ran into the guns of the Inniskillings who met them with a volley that tore the heart out of the regiment. The French attack on the left moved forward and bayonet charged Trants Portuguese while they were still in square. This left the Portuguese teetering on the edge of collapse, though they managed to hold on for another turn. The Cacadores in the woods began to look distinctly shifty as the French hammer blow descended. The 4th Dragoon Guards were poised to charge again, when a second roaring volley of French infantry symbols from the Inniskillings finished the 22ieme. General Delaborde's aide was lucky to escape with his life and was left with the uneviable decision of fleeing the field entirely or attempting to outrun an entire squadron of British cavalry. If British dice were hot on the French right, the French dice were on fire on the right. A single volley from the 2nd battalion of the 62ieme Ligne wiped out the Cacadores to a man and only damnable luck on the part of the first battalion spared the 12th Line from complete destruction. However, it looked like this was about the change as the 2nd battalion swung around. Hmmm...I wonder if it fits? Please stay tuned for part three. The above is a snapshot taken with my camera phone. As regular readers are aware, I painted up a Britain Islander for Donogh as a Christmas present. The idea being that the aircraft AS-1 would the flagship aircraft of the Samarran state carrier, Air Samarra. Samarra being of course, the fictional African state that Donogh will be fighting over later in the year at a large game run by the Green Machine club in Kildare. The chap in the man of destiny pose in the middle is a Liberation Miniatures African dictator who has taken up a new career as an airline pilot. I added aviator sunglasses made of greenstuff and a Comrade Bob style leopardskin hat. The uniform will also feature a lot more gold. I'm not entirely happy with the sculpting on the hat and glasses, but I think a lick of paint will improve things. A fortunate set of coincidences meant that the brothers Von Casey and General Du Gormand were available for a game last week. It was a short notice sort of affair and with that in mind, we played the first scenario from the Command & Colours: Napoleonics books, Rolica. Rolica has a wonderful "world turned upside down" feeling about it. The stereotypical Peninsular battle involves the redcoats clinging to a hill while the French pelt them with columns, a caricature to be sure, but not unrepresentative. Rolica on the other hand, is a holding action on the part of the French General Delaborde. Wellesley has advanced on Lisbon and the French are desperately hoping the reinforcements will show up so that they may face the British with something like equal numbers. With that in mind Delaborde picks a strong elevated position and decides to fight a delaying action. He holds the ridgeline until such time as he sees that his position has been outflanked and then retreats in good order to a second holding position. It's a curious thing, a battle (admittedly on the first half of a battle), where both sides achieved their objectives. Delaborde bought himself some time and kept his army together in the face of larger numbers. Wellesley faced the French for the first time that century and pushed them off their hill. He also didn't lose to an army that had a habit of victory in his first independent command against a European foe. This is something I've noticed, particularly when writing Kriegspiels. In the absence of written game objectives, players can often be satisfied with what would seem to be quite ambiguous results. I've run games where both players achieved their stated objectives and because they didn't realise that the other fellow also believes that he's won, they can end the game feeling rather uppish. But back to hard pounding. The French army band, lacking the jingling Johnny. The scenario calls for two British objectives to be placed at the rear of the French position. This was an excellent opportunity to show off some of my French ephemera, like the Strelets army band displayed above. I really like these fellows, mainly because I love brass bands and I recall what a treat it was to have the Garda band playing at our graduation. Anyone who has ever doubted what the fife and drums were for should see the electricity that ripples through a body of men when marching to music. The Brothers Von Casey in dastardly consort. General Du Gormand and I retired to the front room, leaving the Brothers Von Casey in possession of the field for the planning stage of the battle. Our initial hand of cards was a very strong one, including a card called "Le Grande Manoeuvres". This allowed us to move four units a distance of four hexes. Powerful, but it would leave them open to an immediate counterattack as being fagged out from their exertions that wouldn't be able to battle. Our plan was to use this card to advance on the left to threaten the undefended French objective and force the Frenchers to weaken their line. One of the disadvantages of the French army in Portugal was its weakness for looting. A major sore point of the Convention of Cintra, the rather shameful treaty signed shortly after Rolica (though there were several battles to go), was the French were allowed leave with their property, including the loot which they'd taken from the Portuguese. I ran a very successful Kreigspiel a few years ago about a group of British junior officers escorting a convoy of French wagons to a port to be sent to France. The bold move on our left continued, while the French pummelled our centre with long range artillery fire. This move did not have the effects they were hoping for and led to a rethink. In the foreground, you can see the speakers which were providing musical accompaniment, a selection of marches by the band of the French Foreign Legion and the band of the Coldstream Guards. As the British flanking maneuvre began to develop, the French realised that their right flank was hanging badly in the air. The choice had to be made to attempt to shore up their right or to launch a spoiling attack somewhere else? remember how to play "The British Grenadiers"
But faint heart never won fair lady and the French launch a counterattack that could turn the tide of battle. Two battalions of French line move forward, supported by a squadron of Chasseurs a Cheval to threaten the British right, held by the undoubtedly brave, but somewhat inexperienced Portuguese troops. The Portuguese colonel is in two minds, to receive the charge in square, whereupon he will be slaughtered by musketry from the French foot or to try and stick it out in line and be ridden down. One of the great advantages of our hobby is that it offers continuous occupation. There is no point in a wargamers life when there isn't something that wants doing. The trick is of course, to make sure you have the right job for the moment. I had a long old day yesterday and needed to turn my hand with something relatively undemanding. 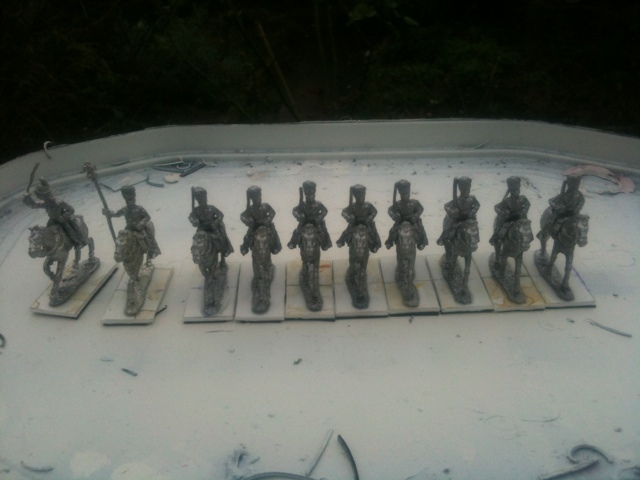 Sticking together three units of HAT Prussian hussars was just the ticket. These chaps are wearing mirlitons and while the horse furniture isn't an exact match for Spanish hussars, it's close enough. I'm not normally a fan of HATs mounted offerings, but because these chaps are slightly smaller than my usual Zvesda/Revell/Italeri cavalry - I think they will look the part. 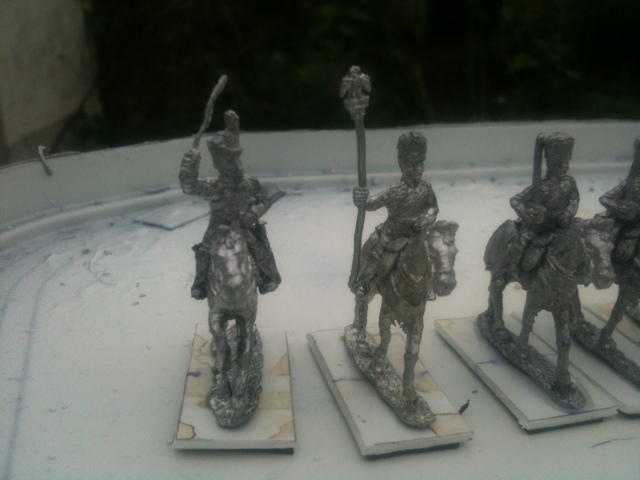 They will form the nucleus of my Spanish light cavalry. Next step a coat of PVA and spray and off to Mark. 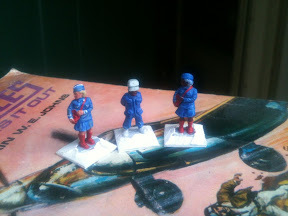 I find the wearing of hats while wargaming a pleasant addition to the hobby. Living with an actress who keeps costumes on hand also helps. With this in mind I've accumulated a number of hats, helmets and other paraphernalia - mostly Eastern European. I was given this by a friend last year and very handsome it is too. 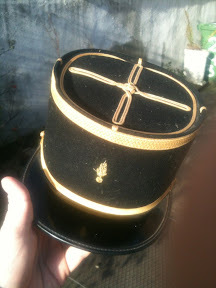 Sadly, I have no idea what it relates to or what sort of kepi it is as it was found in a charity shop. This arrived the other day. I often watch movies while I'm painting, which might seem counter-productive as gifted and talented* though I am, I don't possess a second pair of eyes. I think the trick is to pick films that one has watched many times before and loves. Then you can look up for the good bits and then get back to the matter at hand. Regular favourites include Zulu, Master & Commander and Khartoum. But I've also been very keen on British war movies of the 1940s and 1950s. Films that could have been in the collection, but weren't. The Third Man, Sahara, Bataan, A Matter of Life and Death, The Hill, 633 Squadron, Cockleshell Heroes and Sink the Bismarck! *And did I mention handsome, lissome, strong, funny, brave and with an excellent singing voice? And modest too. When I worked in the book trade I dealt with an elderly man who had served on Monty's staff during the Normandy campaign. I never met him in person as he was too frail to travel, but we spoke several times over the phone. I recall two very particular things. 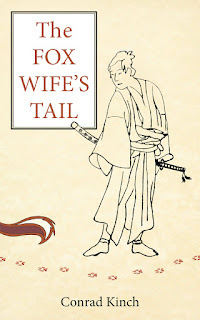 1) The abuse that he heaped on me for sending him "The Full Monty" by Nigel Hamilton. I never knew elderly men knew such words. He had ordered it I hasten to add. 2) He always maintained that Eisenhower could have ended the war in six months if he hadn't tried to maintain a broad front. I feel that in some ways I'm emulating Eisenhower's mistake as at present, I'm attempting to complete an order of battle for the Spanish army, while finishing off my Waterloo armies and struggling though my Indian and Cold War projects. It may take a while, but I have no doubt that we'll finish in Berlin. These are lovely little figures. They're very simple with clean lines and with very little flash. A few seconds trimming with a craft knife was all that was required to get them ready to go. I'll be packing them off to Mark shortly, but there was one problem, I had no guns. Fortunately, my researches indicated that the Spanish used Gribeauval system artillery, so I could use my surplus French guns. The first one picture above, shows an ESCI Guard Artillery gun. This chap here required a little bit more thought. Despite being under the impression that I had many guns tucked away somewhere, I could only put my hand to one. However, there was a carriage spare from my ESCI box and I was able to wed that to a spare barrel from a Zvesda set. It has come to my attention that regular readers of this blog have laboured under the misapprehension that General Du Gorman is a drunken, treacherous, cheese eating sybarite, whose moral turpitude is only matched by his devilish good luck. I was shocked to learn that certain people could get such a wrong impression and wish to issue a full retraction on behalf of this blog and on behalf of the Internet in general; to anyone who may have read this blog and mistakenly assumed that General Du Gorman was a gin sodden, right wing oaf, whose professional life is devoted to the pursuit of a fraud so transparent as to make the Hitler diaries look like a piece of innocent fun and whose many tabletop victories are the result merely of treachery, underhandedness and happenstance. What makes this misunderstanding all the more shocking is that General Du Gorman is in fact an angel who walks among us, whose sweetness and generosity makes a dark world light and shines as a beacon of hope to all his people, everywhere. A simple abstemious man who might have a glass of sherry at Christmas on returning home after entertaining the children at the orphanage with a puppet show, pausing only to mend a broken doves wing on his way. I should also mention that General Du Gorman came across a HAT horse artillery gun that he had forgotten about and brought it over at last nights game. This meant that I won't have to buy another box to get that final gun. It also means that my Spanish artillery will have a suitably hodge podge appearance. On the whole I think I can write this one as a victory. So with the Spanish artillery cobbled together and ready to go off to the painter, it looks like cavalry is the next thing on the agenda. I've been working mustering forces for Waterloo for quite some time now. The Anglo-Dutch forces didn't present much difficulty, though I will have to reorganise my filing system to take account of the influx of Dutchmen. However, I did have to grapple with the problem of French Guard Heavy Cavalry or specifically, the Horse Grenadiers of the Guard. These are not available in plastic, so I had to look at the available figures in metal. I've had good experiences with Pete and Ray at SHQ and they didn't disappoint. When there was a problem with my order, they rectified it immediately. Sterling service. The figures arrived and as you can see they are virtually flash free. There are unfortunately two flies in the ointment*. Firstly, the command pack contains two officers and a chap with an eagle and therefore lacks the trumpeter who usually graces my French cavalry units. Secondly, as you can see above getting the chaps to sit their horses properly is a bit difficult and will require some work with a craft knife and file. I was thinking about my own experience of riding and thought maybe that the rider could be rising in his stirrups. But then, the whole squadron can hardly be doing that! That said, I am happy with the figures themselves, which have a pleasing heft and solidity that I expected of this most iconic of Napoleonic corps. *I recently came across the origin of this particular phrase while reading Ecclesiastes. It was a strange, touching someone across an ocean of time moment.